Our aim is to raise much needed funds to build an all weather running track around the field at Herne Junior School. Herne Junior School in Petersfield is home to over 470 pupils and currently has one of the highest obesity levels in Hampshire, reflecting the national average of 1 in 5 children classified as obese. 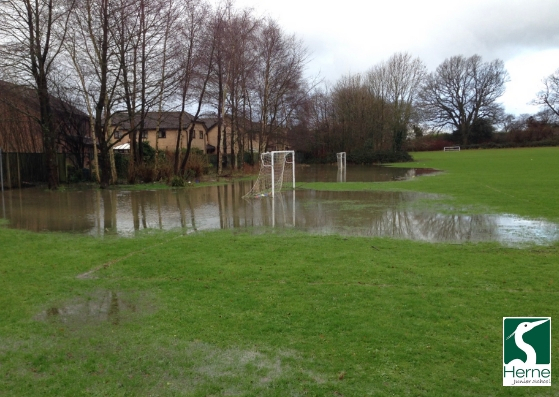 Despite having a large field, its all-weather outside facilities are limited during the winter months as the field gets waterlogged and muddy. This limits children to playing in the small playgrounds and activities such as running are impossible. Our plan is to increase activity levels by building an all-weather 500 meter running track around the field, making exercise accessible to all pupils, all year. It’s widely recognised that children do less exercise these days and many don’t even walk to school. Today’s children prefer playing computer games over outside activities and this lack of exercise can lead to weight and posture issues, poor concentration, mental health issues and even bullying. As children move towards senior school, they inevitably face lots of change, not helped if they are also dealing with negative body image, low self-esteem and lack of movement skills. This has the detrimental effect of putting them off taking part in physical activities and the situation only worsens as they get older. The Daily Mile Government Initiative tackles many of these issues and has proven results. We would like to be part of this initiative and help our children improve their physical and mental wellbeing, before it’s too late. The track would cost around £65,000, however to raise this through the Parents Association alone would take a very long time. The new running track would include distance markers indicating how far children had run, allowing them to record their progress and set themselves personal goals based on their own ability. Petersfield Infant School has 360 pupils and would also be given access to the track, meaning over 800 children will regularly benefit from this facility. There are at least four smaller schools (Buriton, Langrish, Froxfield and Steep) within a 10-minute car journey and most of these schools can’t afford such an excellent resource; we would make the track available to these schools. Park Run Juniors have also expressed an interest in holding a weekly junior park run event on the track. The nearest junior event to Petersfield is currently Waterlooville.